iD#6. Ceci n’est pas une voiture. Nomadic devices loom around the museum. Project description Ceci n’est pas une voiture. Ceci n’est pas une voiture. Nomadic devices loom around the museum is born as a documentation and reflection exercise on the construction of mobile devices as elements of an expanded concept of the Museum or going as far as being an alternative to it. The prospect of subverting the logic of the Museum by building mobile devices has a long tradition. Since Marcel Duchamp’s famous suitcase (Boîte-en-valise, 1941) or Roger Filliou’s hat (Galerie Légitime, 1962), the initiatives to move the aesthetic experience beyond the limits of the museum have multiplied. However, this same tradition of “travelling art” (Isidoro Valcárcel Medina, 1976) has also been the object of a recent co-optation by the conventional Museum. Indeed, in the last decade we have witnessed a proliferation of attempts to expand the perimeter of the traditional Museum with portable structures (the temporary pavilions of the Serpentine Gallery since 2000, the project for the Temporary Guggenheim Tokyo in 2001 or, more eloquent if anything, the recent Chanel Contemporary Art Container by Zaha Hadid in 2008). Faced with this invasive phenomenon, Ceci n’est pas une voiture aims at documenting and reflecting on those other initiatives which, circulating in the public space, collide with these conventional museum prostheses; to the extent that instead of extending the square meters of the museum, they reformulate the functions of the exhibition display as a nomadic platform nurturing direct and self-managed participation, development of social research and dissemination of educational experiences. In other words, if the temporary pavilions of the conventional museum seek to expand the extent and space of presence in order to reinforce the expansion of the museum’s narrative models, the nomadic devices that loom around the museum would be those who, traveling through the same social landscape, experiment with ways of understanding the exhibition cell as a space for reception and creation of plural and critical narratives against the hegemonic model. 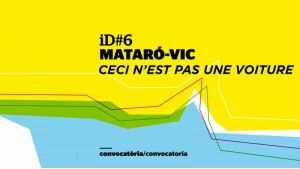 Ceci n’est pas une voiture is conceived as a work in progress that combines processes of research, workshops, production and dissemination. With this objective, it is carried out as a series of activities each of which is designed as a Parking episode. Parking 01: Consulta Museos portátiles. July 2010. Students of the “Políticas del arte contemporáneo: nuevos mecanismos de producción y gestión” course of the Master in Estudios Avanzados de Historia del Arte (UB) carried out an initial approach to the above-mentioned issue, presented as Consulta in Can Xalant between May and July 2010. Open call for a project of intervention in the public space of Mataró using Idensitat’s Dispositivo Itinerante (Touring Device) as a tool for research and production. This activity is part of the collaboration program between Idensitat and Can Xalant for 2010-11 (iD#6 Mataró). Open call for a project of intervention in the public space of Vic using Can Xalant’s CX-R as a tool for research and production. This activity is part of the residency program of ACVIC. Centre d’Arts Contemporànies, in collaboration with Idensitat (iD#6 Vic). Parking 04: Caravan of nomadic devices. Plaça Major Vic. September, 2011. Parking of a day of various nomadic devices in the Plaça Major of Vic, prior to their moving to the exhibition space where they will remain as part of the exhibition. During the first week of the exhibition, one of the devices will be stationed near the ACVic art center in order to carry out a one-week workshop, led by an invited artist. Parking 06: Exhibition Ceci n'est pas une voiture. Nomadic devices loom around the museum. ACVIC. Centre d'Arts Contemporànies. October-November 2011. Exhibition documenting the different study cases. The conferences are organized as three working sessions in line with issues proposed by MNCARS’s Department of Public Programs: Radical pedagogy, Other Institutions, Mobility and Social space. The publication of Ceci n’est pas une voiture, conceived as a space for reflection and as a diary of the experience, will serve also as a catalogue of the exhibition. The publication will be edited as a special issue of Roulotte (www.acm-art.net/roulotte4.html). It will include material from the exhibition, workshops as well as the interventions of the conferences.